When the history of Sir Alex Ferguson's Manchester United career is finally written, a special place in the story will be reserved for John Sivebaek. Sivebaek was the man who gave Ferguson the first victory - and first goal - of his tenure with the winner against Queens Park Rangers at Old Trafford on 22 November 1986. It was a fleeting moment of glory for the former Denmark defender in a Manchester United career that lasted only 31 games before Ferguson sold him to French side St Etienne the following summer. But the strike that ended 213 scoreless minutes under Ferguson, and gave him his first taste of success with a 1-0 win, ensured Sivebaek can play his part in the celebrations of the Scot's 25th anniversary at Old Trafford. He told BBC Sport: "I don't know if I deserve a place in Manchester United's history but it is nice when people remember you scored the first goal for Alex Ferguson after he arrived at the club. It is something to be proud of. Game 1 - Oxford 2-0 Manchester United. (Nov 1986) The reign started with a defeat against a club that later crashed out of the Football League. John Aldridge scored for Oxford. Game 100 - Manchester United 2-0 Nottingham Forest. (Dec 1988) The Ferguson revolution was in full swing. Jim Leighton was installed as goalkeeper and Mark Hughes came back from Barcelona. Game 500 - Manchester United 2-1 Manchester City. (Feb 1996) United were on a roll now. The title drought was over and a double was secured. Lee Sharpe and Frenchman Eric Cantona scored the goals. Game 1000 - Manchester United 2-1 Lyon (Nov 2004) Ferguson's place among the greats of the game was secured, but testing times were still to come. "I don't remember too much about it except that it was a free-kick 20 yards out. It was a big goal because it gave Sir Alex his first win at Manchester United and it was also big for me because I didn't score too many. "I was happy, Sir Alex was happy and I know everybody else was afterwards because we needed a win and every new manager likes to get that first win after his arrival at a club. Now we know it was the first of so many victories for him." Sivebaek was signed by Ferguson's predecessor Ron Atkinson and recalls the day Ferguson arrived at United's old training headquarters, The Cliff. He said: "I remember on his first day at United he was smiling and obviously very happy to be at the club. He held a meeting and talked to every player. "When we went out on to the training ground it quickly became evident that this was a man who had clear ideas and knew what he wanted. You could feel a change from the way things had been under Ron Atkinson from the first day he was there. "He had his system, his methods and his own ideas but he also listened before making decisions. It took him time to settle on the right team but he was figuring out how to achieve these things with the players he had and what players he would need to bring in to build it up and make it work. "He knew he couldn't change the whole team straight away but he obviously knew things needed to change. He built it slowly, which meant it was a while before he was successful and won the FA Cup in 1990. "This is what he is like and I'm sure he still is today. He is very determined about what he wants to do and has a style, which is a really big quality for a manager. And he had a very big personality, which is what you need if you are going to stay at a club like Manchester United for 25 years." Sivebaek was eventually replaced by England full-back Viv Anderson, but has no hard feelings towards Ferguson about the manner of his departure. 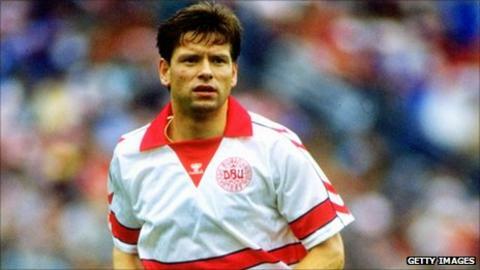 "I was the Denmark right-back," says Sivebaek, "but at that time maybe he was more into 4-4-2 and wanted a more defensive player like Viv Anderson whereas I was more of a wing-back. "But we never had any bad words. He said he still thought I was a very good player and could stay but he couldn't promise me regular football. I had my international career to think about with Denmark, so I went to St Etienne in France, but I have always had this great respect for him and we parted on good terms." Sivebaek added: "It is a really fantastic achievement to be at a club like Manchester United for 25 years and his record is tremendous. What he has done for the club is wonderful and it will be very difficult to come after him. "Sir Alex deserves all the good words people say about him because of the way he does things and the way he is as a person. This is why I respect him so much. "I was only there about a year with him but he was always nice to me. I have seen him a lot of times since and it is always good to meet him. I have seen some quotes from players criticising him but I can't really recognise this person and I have only good words to say about him."